Forest Regeneration and Restoration – Severe fires and a changing climate are contributing to poor postfire conifer regeneration in California. Where are forests regenerating and where are they not? When managers opt for restoration, where should seeds be sourced from to account for climate change? Conservation Biogeography – Environmental changes are driving shifts in the geographic distribution of species. What management actions can we take to save disappearing wildlife? Aburto-Oropeza O., Johnson A.F., Agha M., [and 90 others, including Stewart J.A.E.]. (2018) Harnessing cross-border resources to confront climate change. Environmental Science and Policy, 87, 128-132. Stewart J.A.E., Wright D.H., & Heckman K. (2017) Apparent climate-mediated loss and fragmentation of core habitat of the American pika in the northern Sierra Nevada, California, USA. PLOS ONE, 12, e0181834. Westphal M.F., Stewart J.A.E., Tennant E.N., Butterfield H.S., & Sinervo B. (2016) Contemporary drought and future effects of climate change on the endangered blunt-nosed leopard lizard, Gambelia sila. PLOS ONE, 11, e0154838. Stewart J.A.E., Perrine J.D., Nichols L.B., Thorne J.H., Millar C.I., Goehring K.E., Massing C.P., & Wright D.H. (2015) Revisiting the past to foretell the future: summer temperature and habitat area predict pika extirpations in California. Journal of Biogeography, 42, 880–890. Appendix S3: Animation of projected future fate of pika at 67 sites in California, USA. Interactive version of Appendix S3. Move the slider to adjust summer temperature. Stewart J.A.E. & Wright D.H. (2012) Assessing persistence of the American pika at historic localities in California’s northern Sierra Nevada. Wildlife Society Bulletin, 36, 759–764. Stewart J.A.E., Anderson S., Nguyen C., & Wright D.H. (2017) High-elevation species and natural communities in the northern Sierra Nevada, final report: State Wildlife Grant F14AF00632. California Department of Fish and Wildlife, Sacramento, CA. Sinervo B, et al. (2017) Climate change and collapsing thermal niches of Mexican endemic reptiles. UC Office of the President: UC-Mexico Initiative. Stewart J.A.E., Thorne J.H., Gogol-Prokurat M., & Osborn S.D. (2016) A climate change vulnerability assessment for twenty California mammal taxa. Information Center for the Environment, University of California, Davis, CA. Thorne J.H., Boynton R.M., Holguin A.J., Stewart J.A.E., & Bjorkman J. (2016) A climate change vulnerability assessment for California’s terrestrial vegetation. California Department of Fish and Wildlife, Sacramento, CA. Wright D.H., Furnas B.J., Anderson S., Stewart J.A.E., Nguyen C., & Callas R. (2015) Ecoregional biodiversity monitoring for change over large spatial scales, final report: State Wildlife Grant F12AF00829. California Department of Fish and Wildlife, Sacramento, CA. Stewart J.A.E. (2013) Distribution and abundance of pikas in the greater Yosemite ecoregion: final report. George Melendez Wright Climate Change Fellowship Program, Hancock, MI. 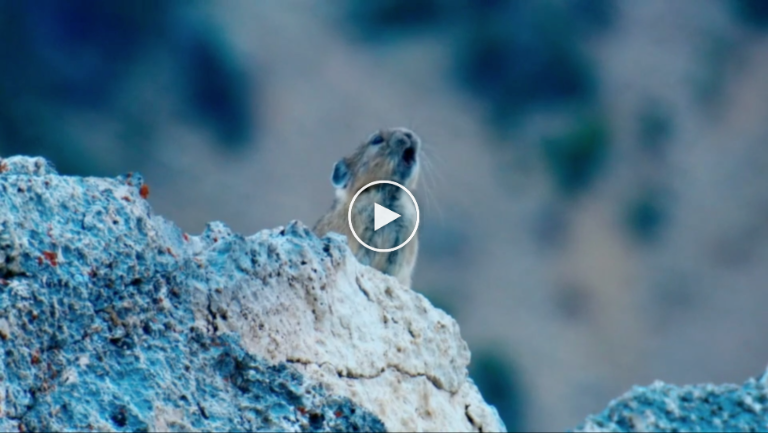 Our research on the American pika was recently featured on the National Geographic Channel. Idled farmland presents habitat restoration opportunities in San Joaquin Desert, Tim Stephens, UCSC News Center. 15 January 2019. What doesn’t work for crops may work for endangered lizards, Dana Kobilinsky, The Wildlife Society. 30 January 2019. North of Lake Tahoe, the pika has gone locally extinct, Diana Madson, Yale Climate Connections. 26 January 2018. Rabbit Relatives Reel from Climate Change, Christopher Intagliata, Scientific American’s 60-Second Science. 2 September 2017. Years of Living Dangerously, Season 2, Episode 6. National Geographic Channel. 30 November 2016. Vanishing wildlife on a warming planet. Stewart J.A.E. Special for USA Today. September 2016. Drought helps predict how climate change might affect an endangered species. Tim Stephens, UCSC Newscenter. 4 May 2016. 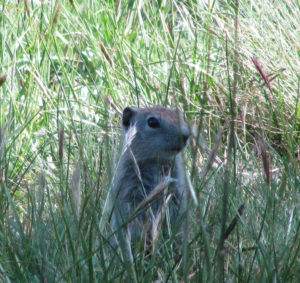 Climate change pushes pikas from traditional sites in the Sierra. Edward Ortiz, Sacramento Bee. 14 February 2015. MoveShake video profiling ASC’s Greg Treinish, and featuring yours truly. Alexandria Bombach, Red Reel. 2013. Counting Climate-Challenged Pikas. Quest. QKED. 28 September 2012. Stewart J.A.E. (2018) Invited Seminar. Conserving wildlife in a changing world. Sierra Science Lecture Series, Sierra College, Grass Valley, CA. Stewart J.A.E. (2016) Invited Seminar. Methods for assessing vulnerability of species to climate change. National Institute of Ecology, Seocheon, South Korea. Stewart J.A.E. (2014) Invited Seminar. On the distribution and abundance of pikas in Yosemite. Yosemite Forum, Yosemite Valley, CA. Stewart J.A.E. & D.H. Wright. (2017) Invited Presentation. Geographically representative surveys of whitebark pine occurrence and stand characteristics in the northern Sierra with implications for vulnerability to climate change. 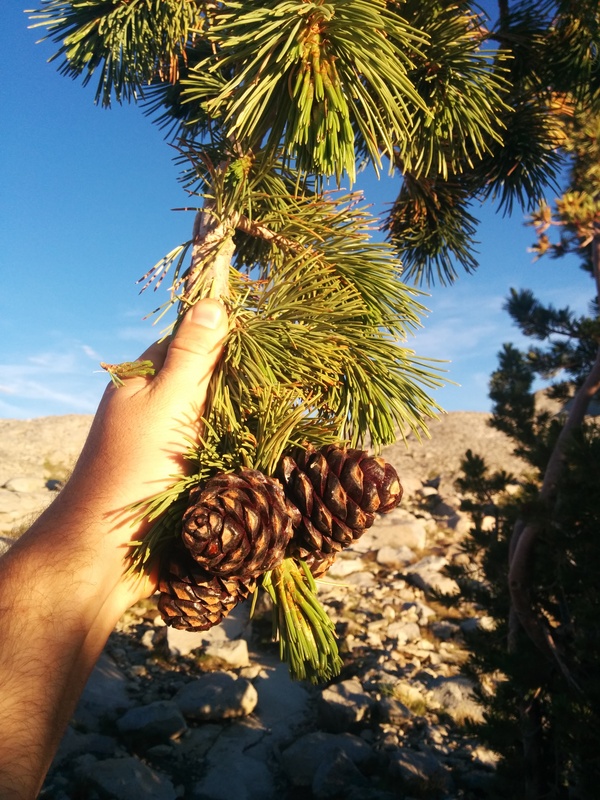 Field-based Studies on Whitebark Pine in California – A Data Sharing Session, Parsons Lodge, Yosemite National Park, CA. Stewart J.A.E. & H.S. Butterfield. (2017) Invited Presentation. Habitat restoration opportunities for endangered species of the San Joaquin Desert. San Joaquin Desert Strategic Fallowing Workshop, National Center for Ecological Analysis and Synthesis, Santa Barbara, CA. Stewart J.A.E. 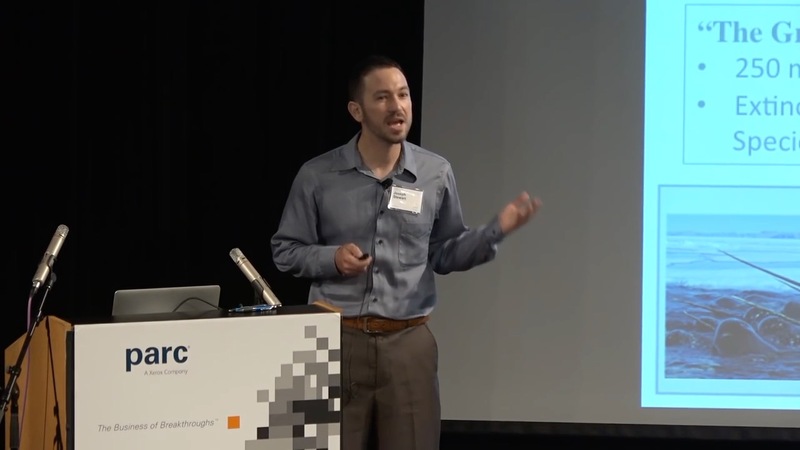 (2016) Invited Presentation. Descent to the underworld: climate change opens gap in distribution of American pika in the Sierra Nevada, USA. Mathias Symposium, Bodega Bay, CA. Stewart J.A.E. (2016) On the vulnerability of biodiversity to climate change. Science on Tap, a monthly lecture organized by UCSC Women in Science and Engineering, Santa Cruz, CA. Stewart J.A.E., B. Sinervo, M.F. Westphal, H.S. Butterfield, & E. Tennant. (2015) Interaction of exotic grasses and climate drives contraction of blunt-nosed leopard lizard range at the northern range margin. Thirteenth Annual Species Interaction Workshop, Stanford University, Stanford, CA. Stewart J.A.E., M. Gogol-Prokurat, J.H. Thorne, E. Tennant, B. Sinervo, M.F. Westphal, H.S. Butterfield, & D.H. Wright. (2015) Assessing climate change vulnerability of California species. California Dept. of Fish and Wildlife Science Symposium, Davis, CA. Stewart J.A.E., B. Sinervo, M.F. Westphal, & H.S. Butterfield. 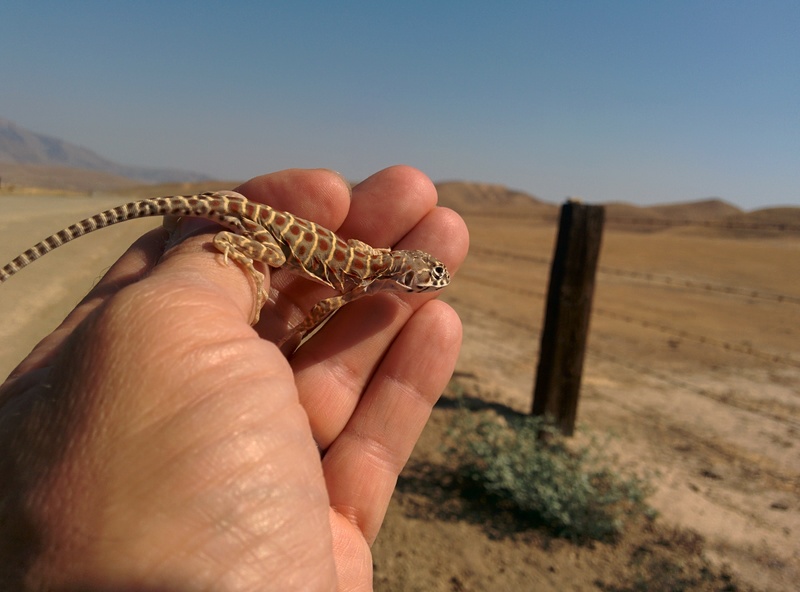 (2015) Temporal and spatial relationships between vegetation productivity and type and the endangered blunt-nosed leopard lizard. California Native Plant Society Conservation Conference, San Jose, CA. Stewart J.A.E. (2013) Interactions between climate, vegetation, prey, and the federally endangered blunt-nosed leopard lizard (Gambelia sila). Eleventh Annual Species Interaction Workshop, Stanford University, Stanford, CA. Stewart J.A.E., R.D. Cooper, M. Westphal, S. Butterfield, & B. Sinervo. (2013) The potential impacts of climate change on local extinction of blunt-nosed leopard lizards. Blunt-Nosed Leopard Lizard Workshop, California State University Bakersfield, CA. Stewart J.A.E. (2013) Using historic revisit data to model climate change impacts on pikas. Annual Conference the Western Section of The Wildlife Society, Sacramento, CA. Stewart J.A.E. (2013) Pikas in Yosemite: patterns of occurrence at two spatial scales. George Wright Society Conference on Parks, Protected Areas, and Cultural Sites, Denver, CO.
Stewart J.A.E. (2012) Moving beyond resurveys of historic pika record locations: using relict feces to test the hypothesis of climate-mediated range retreat in California, Ecological Society of American Meeting, Portland, OR. Stewart J.A.E., J.D. Perrine, D.H. Wright, & C.P. Massing. (2012) Resurvey of historical pika locations in California: analysis and critique, North American Congress for Conservation Biology, Oakland, CA. Stewart J.A.E., & D.H. Wright. (2011) Persistence and apparent extirpation of American pika (Ochotona princeps) at historical California localities. Annual Conference the Western Section of The Wildlife Society, Riverside, CA. *Received award for best student presentation. Stewart J.A.E., & D.H. Wright. 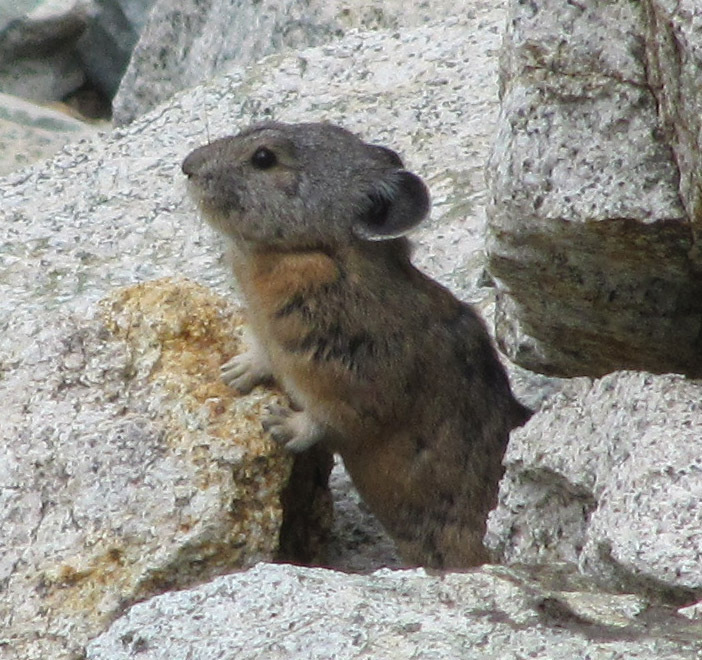 (2010) Investigating the status of American pika (Ochotona princeps) at historical northern Sierra sites. Annual Bay Area Conservation Biology Symposium, San Francisco State University, CA. Citizen Science ->> Pika Citizen Science Survey – adventurers and citizen scientists invited to help collect baseline data on pika occupancy in areas where climate change may cause local extinction over the coming decades. Places mammal species haven’t been documented for decades – have you seen any of these mammal species in California? Document your observations on iNaturalist!